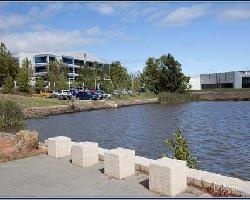 The city of Canberra is ideally situated around the shores of the picturesque Lake Burley Griffin. You will find the Canberra CBD located on the northern edge of the lake and getting around the city centre is very easy beacuse of the wide streets, minimal traffic and lack of traffic lights. This gives the Canberra CBD a very laid back and relaxed feel to it when compared to other capital cities around Australia. The Canberra city centre features numerous corporate offices, government departments, university buildings and retail outlets. There is also a range of luxury hotels and apartments in Canberra that have accommodation to suit the needs of corporate executives, government officials, families and holiday makers. Just a short distance from the city centre are a number of fine dining restaurants, cosmopolitan cafes, tourist attractions, the Australian National University, the popular lake front and the Canberra International Airport. 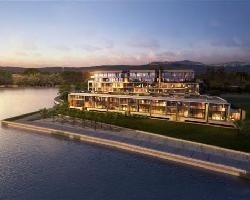 The trendy inner city suburb of Kingston is perfectly positioned on the south east edge of Lake Burley Griffin. It has a mixture of premier residential areas, shopping precincts, large commercial centres and even a newly built waterfront region. Kingston provides travellers of all persuasions with a variety of accommodation in Canberra including fully furnished 1, 2 and 3 bedroom self contained serviced apartments that have been specifically designed to meet all of your accommodation requirements. Because of its centreal location Kingston is only a short drive from Parliament House, government department buildings, the Canberra Airport and all of the major tourist attractions that are situated on the southern banks of the lake. Braddon is an inner city suburb of Canberra that is conveniently situated 2 kilometres due north of the city centre along the main thouroughfare, Northbourne Avenue. It is positioned just above the tree lined expanses of Haig Park and provides a commercial and retail centre for the neighbouring suburbs of Ainslie, O'Conner and Turner. The majority of office buildings, businesses and shops in Braddon are located along Northbourne Avenue and close by you will find a range of affordable accommodation ranging from hotel rooms through to self catering serviced apartment accommodation. Only a short car or bus ride from Braddon will place you in the Canberra CBD or even across the bridge to the Parliament House of Australia, which is why many people choose to stay in Braddon when they are visiting the Australian Capital Territory. The central location right on the eastern side of Parliament House is what makes Barton such a popular place to stay for business travellers and government officials. Barton is one of Canberra's premier addresses because it is surrounded by the restaurants of Manuka on the south, the shopping of Kingston on the east, the major tourist attractions of Parkes on the north and parliament house on the west. There are numerous government department building and a range of luxury hotels and apartments in Barton providing convenient accommodation for people do business with any of the government agencies in Canberra. Barton is a very leafy suburb and has wide tree-lined streets, lots of parklands and sporting facilities which you can make the most of whilst staying in Canberra. The main commercial and business centre in the north west of Canberra is the suburb of Belconnen. It contains an extensive shopping precinct that is filled with all sorts of different retail outlets, large departments stores and office buildings. Belconnen is beautifully positioned on the banks of Lake Ginninderra and along the water front area you will find a number of fine dining restaurants with great views across the water. Because it is a major commercial centre the suburb of Belconnen also services many of the surrounding residential suburbs such as Macquarie, Bruce, Page, Hawker, Cook, Forey, Sculin, Higgins, McKellar and Aranda. 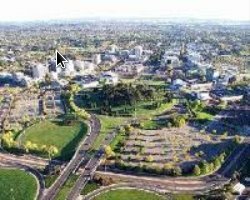 If you are visiting the ACT for business in any one of these suburbs then you will find that Belconnen is a great place to stay because everything that you need will be close at hand. 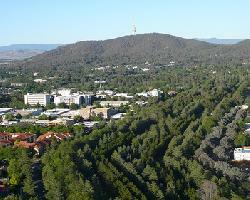 Manuka is actually an area of Canberra that is located within the suburb of Griffith. It has become extremely popular over the years because of its entensive array of fine resturants that provides locals and visitors with cruisine from all over the world. It is situated only 1 kilometre south east of Parliament House and is also home to the Manuka swimming pool and Manuka Oval where cricket is played dusing summer and AFL football matches are played during winter. You will also find that Manuka has a number of cheaper take-away outlets, cinemas, galleries, churches and fully self contained serviced apartments that have all of the facilities to make you feel right at home during your stay in Canberra. The northern suburb of Watson is located alongside the main road between Canberra and Sydney, the Federal Highway. It is only 6 kilometres north of the Canberra city centre and is right next to Thoroughbred Park, the main race course in Canberra, and Exhibition Park where the Summernats is held every year. Watson and the neighbouring suburbs of Downer, Hackett and Dickson are largely residential suburbs, but they also inlcude the Australian Catholic Univeristy Canberra campus, Dickson College, the Canberra Business Centre and the Canberra Technologh Park. There is a range of budget motels and quality hotels to stay at in and around Watson, providing you with an affordable place to stay in the ACT that is only a short drive from the city centre and all of the tourist attractions in the city. 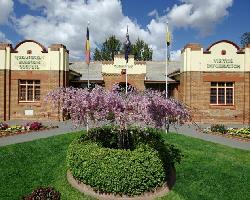 The city of Queanbeyan is technically located across the border in New South Wales but it is unoffically still considered a part of the ACT. Queanbeyan is located only 10 minutes drive east of the Canberra city centre and is only a short 5 minutes drive south of the Canberra Airport. The city is situated on the banks of the Queanbeyan River and has a large business district full of shops, factory outlets, warehouses and other industry related services. The city of Queanbeyan itself is made up of a number of different suburbs including Crestwood, Queanbeyan West, Queanbeyan East, Karbar and Jerrabomberra. Right across all of these areas there is a number of different accommodation venues ranging from cheap tourist holiday parks right through to luxury hotels for the discerning traveller. 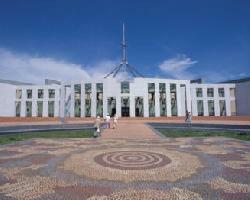 One of the most popular attractions in Canberra is Parliament House. It is where the Australian parliament sits and you can take a free tour around this complex. At the National Gallery of Australia you will find lots of amazing works of art from local and international artists. You can pay your respects to the fallen men and women who have served this country over the years at the Australian War Memorial. Held every spring the Floriade Festival is an explosion of colourful flower arrangements and garden designs that can to be seen to be believed. Located in Canberra is the Royal Australian Mint where visitors can discover the history of money in Australia and see the process involved in making coins. The Old Parliament House in Canberra is now a historic building that houses the Museum of Australian Democracy. Located in the heart of the Canberra CBD the Natianal Convention Centre hosts many conferences and conventions throughout the year. A relaxing way to spend time in Canberra is to take a walk around the beautiful Lake Burley Griffin. Visit the Australian National Botanic Gardens to see an extensive collection of natives trees, schubs, flowers and other plant life. Whilst staying in Canberra you must see the entire city from the observation deck on top of Black Mountain Tower. Adults and kids of all ages will enjoy testing their knowledge at the National Science and Technology Centre. Situated to the west of the Parliament House are all of the different embassies of the world, which you can drive around and admire the difference in design and construction. For a great night out you should head down to Manuka and have a meal at one of the many fine dining restaurants located in this area. The main shopping area in the Canberra CBD is the Canberra Centre Shopping Complex, which is well situated just on the east side of the city centre. The north western area of Canberra is home to many people and the main shopping centre in the region is the Westfield Belconnen, which has a huge variety of different shops, department stores and retail outlets. Open from Thursday through to Sunday the Fyshwick Fresh Food Markets are ideally positioned to the south east of Parliament House next to Kingston and has a range of fresh seafood, fruit and vegetables, meats, Asian groceries, delicatessens and cafes. Servicing the ever expanding southern suburbs of Canberra the Woden Plaza is an extensive shopping precinct that has everything that you could possibly want whilst staying in Canberra. Located on the southern edge of Canberra and on the banks of Lake Tuggeranong is the Hyperdome and Tuggeranong Square Shopping Centres which houses all sorts if different businesses and retail shops. 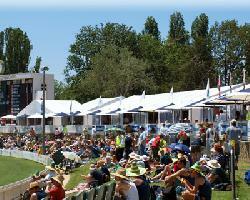 Located just to the south east of capital hill the Manuka Oval is where AFL footy matches in played during winter and cricket is played during the summer months. The main Canberra racecourse, known as Thoroughbred Park, is located north of the CBD and holds regular track mettings throughout the year. Canberra has some fine places to have a hit of golf and some of the best courses are the Federal and Royal Canberra Golf Clubs. The Canberra Yatch Club is positioned on the banks of Lake Burley Griffin just to the north of Parliament House. Canberra Stadium is where NRL rugby matches are played in Canberra and it is ideally situated in the heart of the Australian Institute of Sport. Directly north of the Canberra CBD you will find the National Sports Club with its indoor cricket centre and tennis courts as well as the ACT Netball Centre and Hockey ACT right next door. 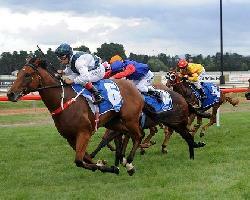 The Queanbeyan Racecourse is centrally located in Queanbeyan and holds lots of horse racing meetings, as well as functions throught the year. You will find the Canberra International Sports and Aquatic Centre in the north west suburb of Belconnen, just a short distance from the shores of Lake Ginnindera.